Transform your greenery into a work of art with these modern rectangular wall-mounted box planters. Made of durable ceramic, these pots are perfect for containing succulents, kitchen herbs, flowers, cactus and so much more. One small hole allows you to mount these planters on any wall in a variety of ways; vertically, horizontally, abstract or even in a square shape. Not only can these containers hold a variety of vibrant greenery, they could even be used for holding office supplies, organizing crafts, toys or storing cosmetics and makeup. No matter how you utilize these pots, they will become the perfect contemporary and stylish addition to any home or office space. **Official MyGift® product. ** Plants are not included. SPECS: Each Pot - 4 H X 6 W X 4 D (in inches). 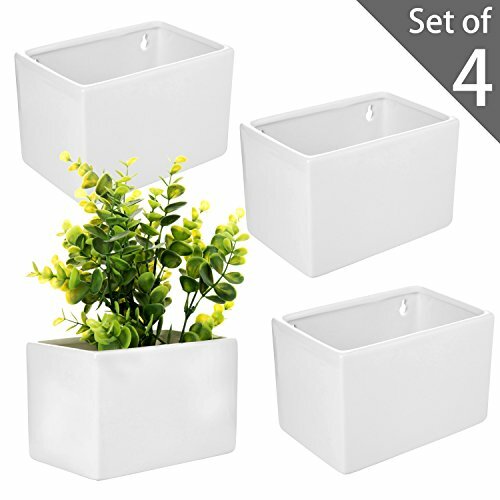 MODERN SIMPLICITY: Set of 4 rectangular ceramic wall hanging planter vases with white matte finish. WALL-HANGING: Can be easily mounted on any wall with proper mounting hardware.